Sandra Stotsky spoke yesterday in CT about the common core state standards. Stotsky was one of the 26 people asked to on the common core state standards validation committee. While she has repeatedly has said that she had to sign a confidentiality agreement and is breaking it by speaking about the process, the co-writer of the ccss math standards said that is not true. Can anyone verify Stotsky’s claim? It could possibly be because I said she was a writer, when in fact she was on the validation committee, , or that I probably slightly misquoted her exact words and maybe it was called something else, but I will assume that anyone so close to the process could have identified my mistake. I have heard Dr. Stotsky make this statement. Why would she lie about this? Or maybe the better question is McCallum lying about her statement? Who has more to protect? In the spirit of transparency, I would request McCallum to insist the validation committee’s deliberations be made public as these standards are Federally funded. This whole process has been shrouded in secrecy. If I put on my “critical thinking cap” (which I don’t need CCSS to accomplish) and look at Stotsky’s information vs the CCSSI’s information to taxpayers and legislators, I think believing Stotsky is a better choice. Agree…worded it like I did on purpose. 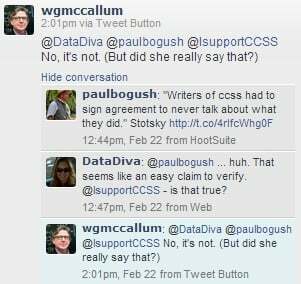 Let the ccss supporters not just come back with more propaganda on why we should support them, but come back with real facts on why people like Stotsky are wrong. I can almost imagine his saying what she said was not true because the document she signed was officially called something different.